Cool on the ball, calm under pressure and an integral part of the meanest defence in Liverpool history, Alan Hansen in a red shirt was class personified. Rated by many as the club's finest ever centre-half, the elegant Scot boasts one of the most impressive medal collections in football. Hansen helped bring eight league titles and three European Cups to Anfield during his 13 years on Merseyside. 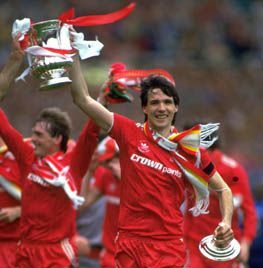 Oh, and in 1986 he captained the Reds to their first ever double. Signed from Partick Thistle for £100,000 on the recommendation of legendary Celtic boss Jock Stein, Hansen arrived on Merseyside as a shy, skinny kid. He made his debut in a 1-0 home win over Derby County in September 1977 and played in the following year's European Cup final triumph over FC Bruges at Wembley. It was not until the magnificent 1978-79 season, however, that 'Jocky' finally ousted the legendary Emlyn Hughes from the team and made one of the two centre-half berths his own. This was the campaign in which Liverpool conceded a miserly 16 league goals. Relying on brain rather than brawn, very few centre-forwards ruffled Hansen. A crisp tackler, his reading of the game was exceptional and he's widely regarded as one of the most skilful centre-halves in British football history. The number six oozed elegance and his graceful style was tailor-made for Liverpool's penchant for patiently building from the back – a tactic that brought huge success at home and abroad. Hansen's aptitude was underlined by his multi-sport prowess which also prompted international recognition at basketball, volleyball, squash and golf. The defender was at his most majestic when striding forward with the ball at his feet, turning defence into attack in the blink of an eye. This skill was never better illustrated than on an unforgettable afternoon at Goodison in November 1982, when he set up Ian Rush for the first of his four goals in a much-celebrated 5-0 romp. Whoever his defensive partner was, and there were a few during his Anfield career, Hansen never seemed phased. Like a fine wine, he seemed to get better with age and when new player/boss Kenny Dalglish decided to relieve Phil Neal of the captaincy in 1985, the centre-back was a natural successor. He reveled in his new-found responsibility and led by example as the Reds clinched a coveted league and FA Cup double at the end of his first season in possession of the armband. Astonishingly, despite winning 26 caps for Scotland, Hansen was snubbed by his country for the 1986 World Cup – a gross error of misjudgment that baffled everyone at Anfield. But his legendary status increased as he skippered the club to a further two championships before a serious knee injury curtailed his career. It's often said that you don't know what you've got until it's gone, and it was no coincidence that Liverpool were to endure almost a decade of defensive frailty following his retirement. Once touted as a future manager, Hansen has since carved out a successful career in the media, notably as a pundit on Match of the Day. He remains a highly respected figure, not just among Liverpudlians but within the game in general.